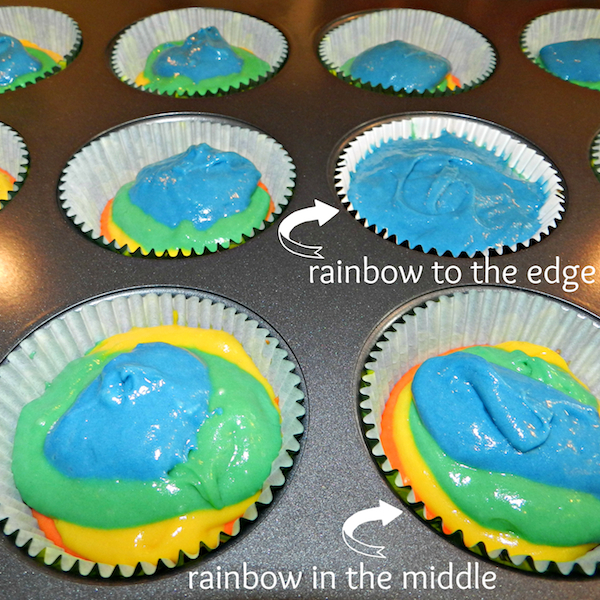 This St. Patrick’s Day I wanted to make one of my favorite themed cupcakes – Rainbow Cupcakes! 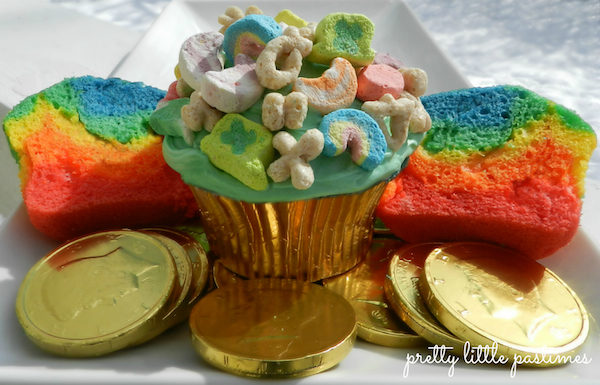 I have made them a few times now, sometimes with green sprinkles on top, a white cloud of frosting, or even a shamrock, but this year I wanted to try them with some Lucky Charms brand cereal to make it a little more playful. I knew I also wanted to keep the “pot of gold at the end of the rainbow” theme, so I searched for some gold wrapped chocolate coins. They were not the easiest to track down, but I found a great little candy shop in our local mall that sold them by the pound. I just might have “accidentally” purchased a little more than I needed (whoops). They may look like I spent hours in the kitchen baking, but they are actually very simple to make and only a couple of extra steps then making a traditional cupcake. Whether you make them for friends, family, or just because, this Pretty Little Pastime is sure to get everyone in the St. Patrick’s Day spirit! Start by preheating your oven to 350 degrees. Line two 12-muffin tins with cupcake liners. In a large mixing bowl, sift together the flour, sugar, baking powder and salt. Add butter, 3/4 cup of milk, vanilla, and almond extract and beat on low until blended. Increase speed to high and beat for another two minutes. With a spatula, scrape the sides of the bowl and add the remaining 1/4 cup milk and egg whites. Beat for 30 seconds on high. Separate the batter equally into 5 small bowls. Add the food coloring one drop at a time to make up the colors: red, orange, yellow, green and blue. You can also add purple, but I skip it so the cupcakes do not get too dark on top. Once you have the colors at your desired hue (remember they do darken slightly while baking), spoon each color one at a time into the liners. Try to pour the batter into the middle of the liner in a steady stream, so it spreads evenly. Continue with each color until all of your tins are 1/2 to 3/4 full. Place the muffin tins on the center rack and bake for 15-20 minutes or until a toothpick inserted into the center comes out clean. Remove the cupcakes and let cool completely. To start your frosting, whip the butter on medium speed for 8 minutes. Once the butter is creamy, add the sugar, milk, vanilla, and salt and mix on low for 1 minute. Turn up the speed to medium and continue to mix for another 6 minutes. Add green food coloring to the frosting to get a pale green color. Top the cooled cupcakes with your frosting in an even layer. Immediately top with a sprinkle of Lucky Charms brand cereal and repeat until all cupcakes are complete. I love making these cupcakes and giving them to people as a little St. Patrick’s Day treat! They are always surprised when they bite in and see all of the rainbow colors. The cake and frosting recipes are also good to keep on hand for a quick cupcake anytime. Enjoy! 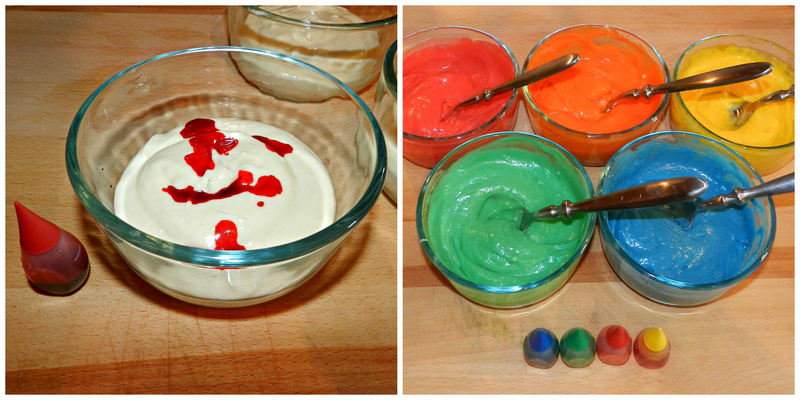 We LOVE making coloured batter cakes! Swirling them is so pretty! I never thought of putting cereal on the top of a cupcake…I’ll have to take another stroll down the cereal aisle tonight to see what I can create! Thank you so much! I am a huge lover of colorful baking projects and the BF LOVES cereal so it was a win-win for both of us! Oh my goodness, these are too cute!! I’ll need to keep this in mind for my second graders next St. Patrick’s Day!